"Peter Bursch's Bröselmaschine - Rise of a Krautrock-Legend! 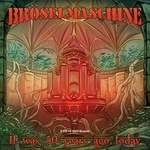 32 years after the release of their last studio album (Graublau, 1985) the Krautrock veteran Bröselmaschine is back with a phenomenal new album as 180 gram gatefold vinyl plus download code. Diversified, soulful and skillful the formation around guitar guru Peter Bursch is presenting the new songs. In June 2014 the remarkable debut from 1971 was voted by the New York music blog Pigeons & Planes on rank 9 of the most important Krautrock albums. 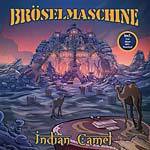 The new one, Indian Camel, with female singer and model Liz is another album for eternity. Featuring famous comedian, multi-instrumentalist and former band member Helge Schneider on saxophone and Nippy Noya on percussions." Color vinyl version. "Peter Bursch's Bröselmaschine - Rise of a Krautrock-Legend! 32 years after the release of their last studio album (Graublau, 1985) the Krautrock veteran Bröselmaschine is back with a phenomenal new album as 180 gram gatefold vinyl plus download code. Diversified, soulful and skillful the formation around guitar guru Peter Bursch is presenting the new songs. In June 2014 the remarkable debut from 1971 was voted by the New York music blog Pigeons & Planes on rank 9 of the most important Krautrock albums. The new one, Indian Camel, with female singer and model Liz is another album for eternity. Featuring famous comedian, multi-instrumentalist and former band member Helge Schneider on saxophone and Nippy Noya on percussions."